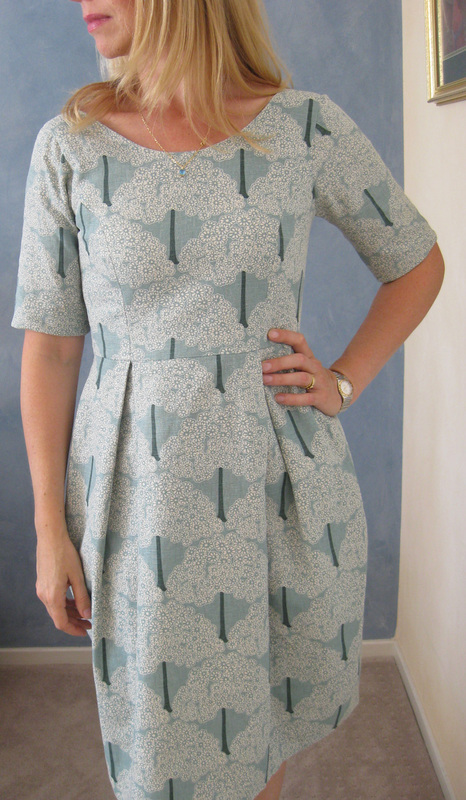 Well, I finished my Elisalex dress. For a really good rundown of the pattern itself and some other bits of info that I am in full agreement with, have a look at Gabrielle’s post of her lovely version here. One thing I will note is that I would recommend eyeballing the skirt length before cutting it as it is LONG so you don’t waste fabric. I just folded my hem over to take off the length (I don’t remember how much but it was several inches) which resulted in a skirt not so pegged at the bottom. 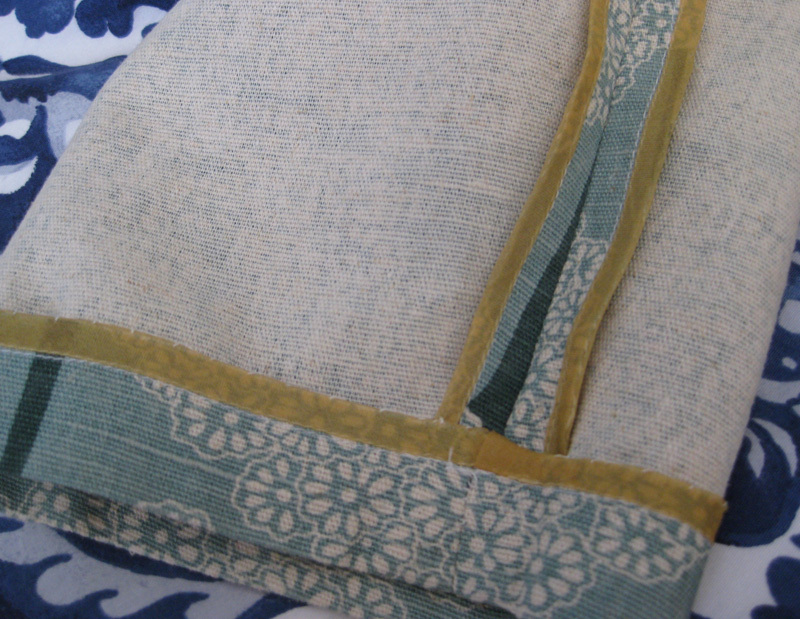 The fabric was a total bargain – $4/m reduced from $30/m upholstery cotton/linen from Spotlight. 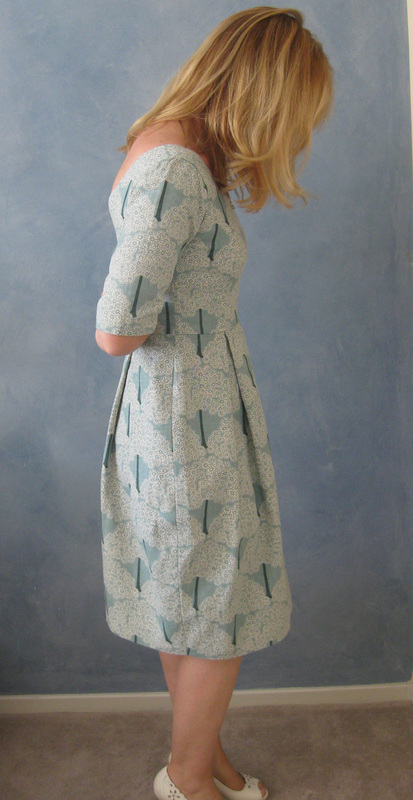 It sewed up beautifully and worked very well with this pattern. Its not a colour I would normally wear – I think I may look a little washed out in it, but I do love it. At $8 for the fabric I couldn’t go past it. I underlined the skirt with vintage silk organza from my stash that I purchased as part of a fabric bulk buy off ebay from a lady from Mudgee. It has found a new home and was basically free. 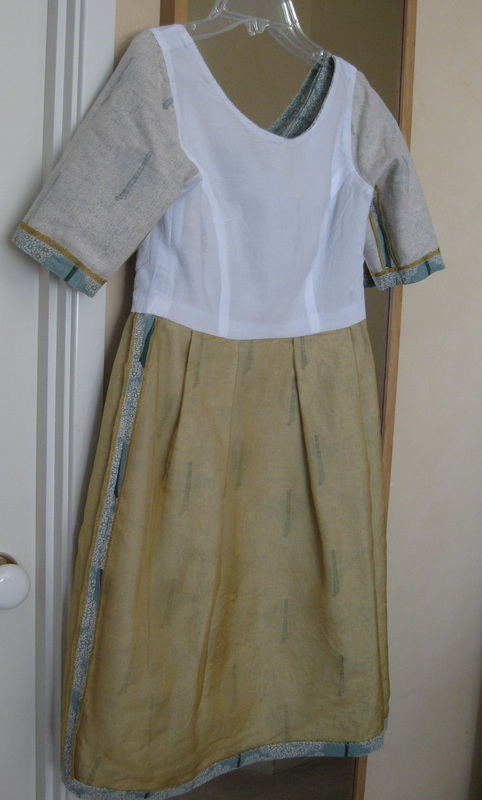 The bodice is lined in a simple white cotton voile, also from stash. 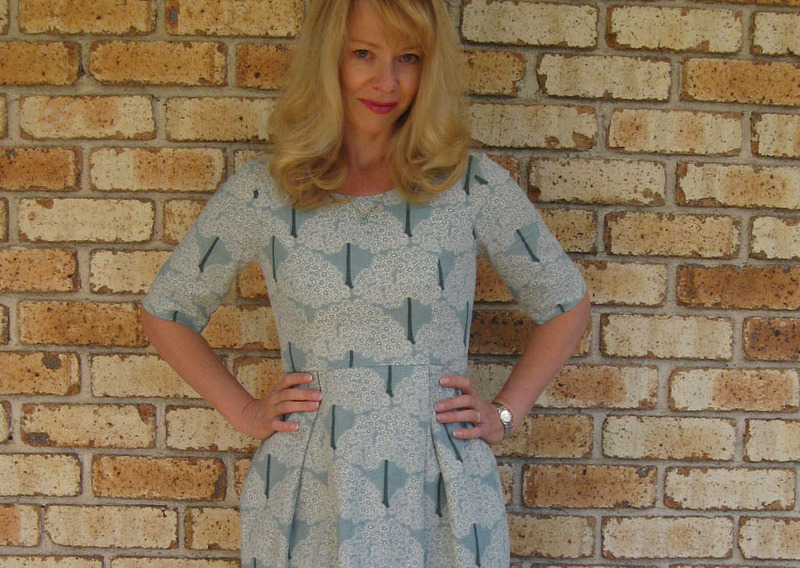 The priciest part of the dress was the pattern ($20 from sewsquirrel) and the zip – I managed to break two in a row (!!!) before I finally managed to get the third one in trouble free. I used an invisible zip. 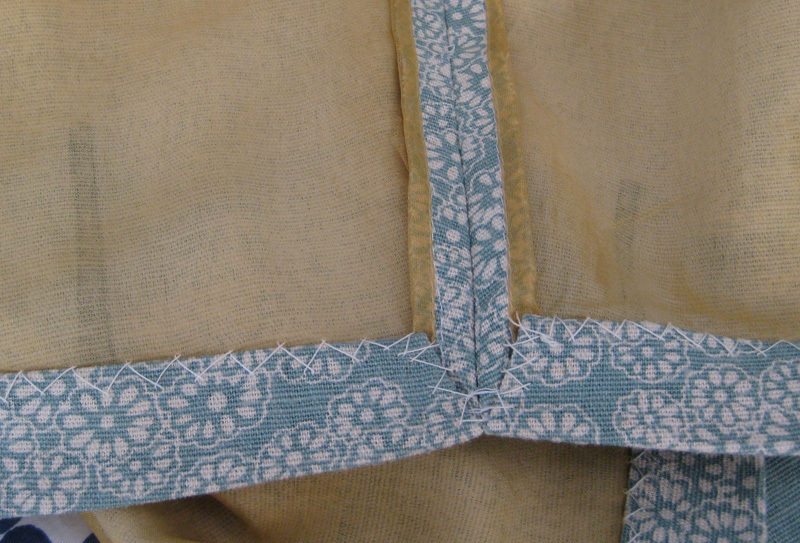 I did make a few adjustments but did not make a muslin as I knew all my adjustments would be to reduce rather than let out. 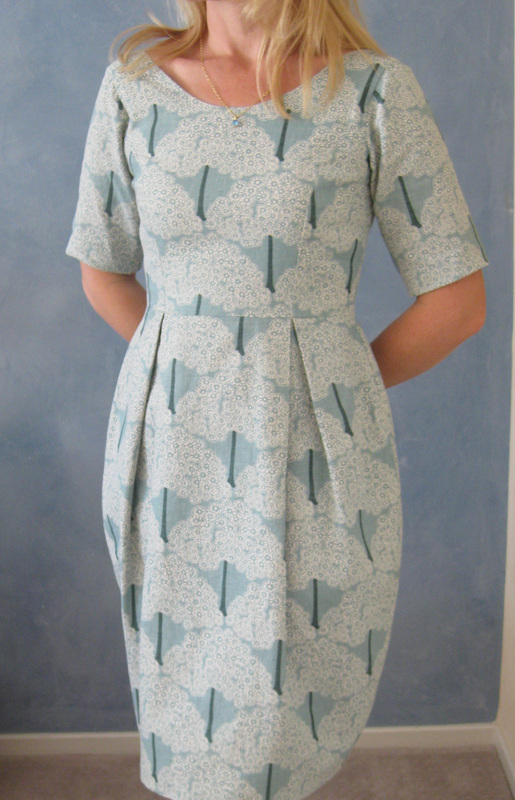 Here is what I did and I hope this post will be useful to any others making this dress that had trouble with back folds/excess around the shoulder area. I started with a straight size 6 and basted the bodice pieces together, but not the sleeves. 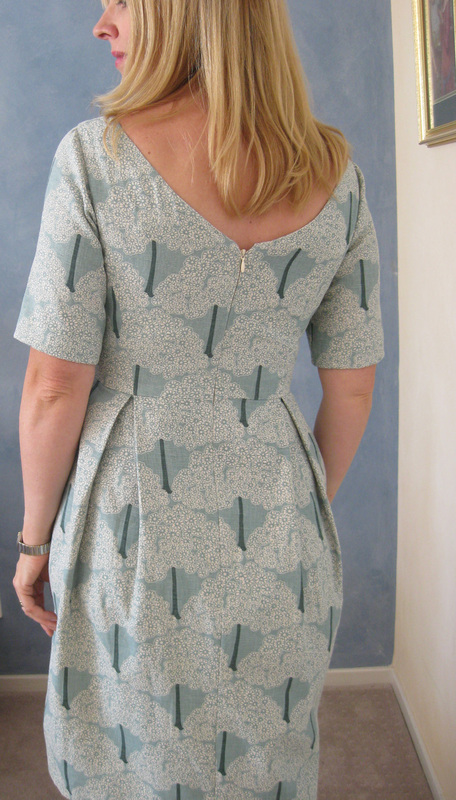 When I tried it on (tip: I pin a normal zip into the side seam making sure I get the seam allowances right. It makes it really easy to check the fit on the bodice without having to sew in the back zipper) I saw I had excess fabric around my shoulders giving me wrinkles/folds of fabric front and back and gaping at the armsyce in the front. The shoulders looked very wide and were drooping off the shoulders. 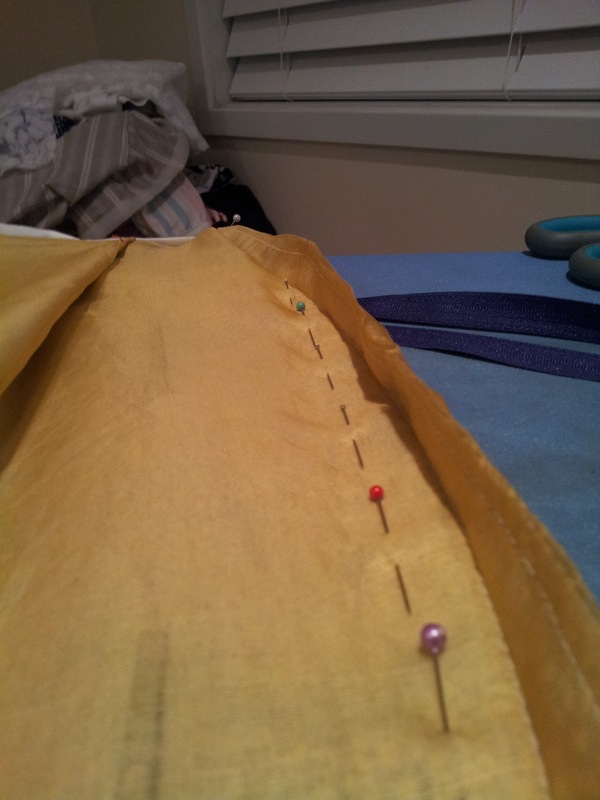 Shaved an extra 1/4 inch off the front princess seam starting just past the notch and back to the armhole. 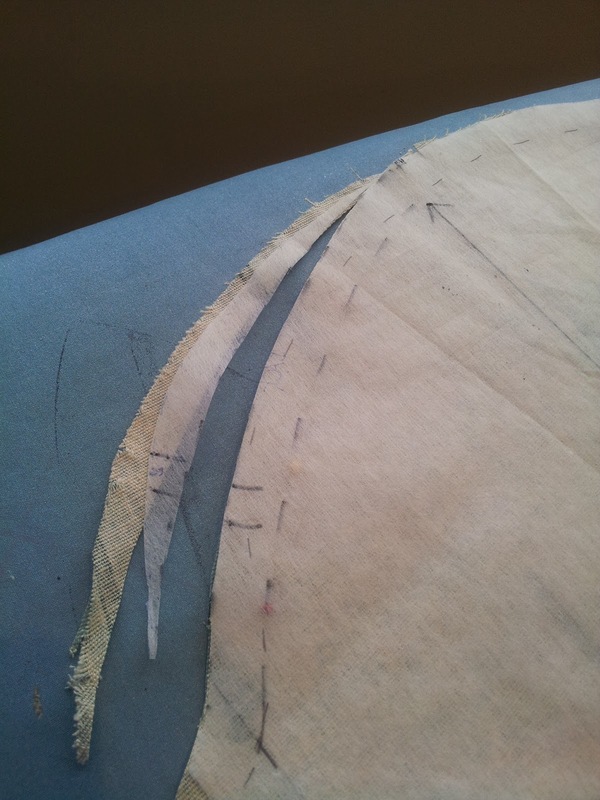 Took out the shoulder seam basting and repinned so no more excess fabric. 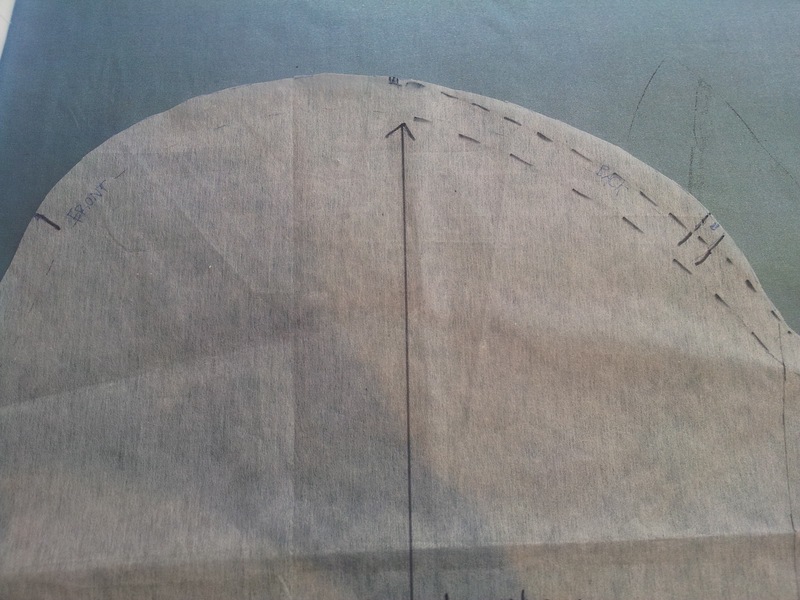 The fix essentially doubled my seam allowance up there and also tapered it down and forward slightly (sloping shoulder adjustment of 1/8″ and forward shoulder adjustment of 1/2″ plus 5/8″ extra seam allowance to get rid of gaping/folds/excess fabric. This meant that my armholes felt too high (note: taking up all that extra fabric at the shoulders did not move the position of the bodice at all from the collar bone down, the adjustment was all in the shoulders) so I lined the orginal bodice pieces up, pinned together and just redrew the armsyce curve, essentially this meant that I lowered it 5/8″ – the same amount that I took up in the shoulders. I am an A-cup but in a padded bra probably measure as a B cup and the bodice size 6 fit my 34″ front curves perfectly, other than the small tweak at the armsyce princess seams. Anyone larger than a B cup will definitely need to do the FBA which By Hand London provide a detailed tutorial for here. Stay stitched the back neckline. Eased the staystitching in a bit, probably an inch all up and then steamed it and pressed it really well with my iron so it did not look gathered and the fabric sat flat again. The linen-ish fabric behaved really well and did what I wanted. When I put in the zipper, I increased the top 3 inches of the back seam allowance so it went from 5/8″ at the waist seam and increased another 1/4″ at the top. It kinda made the back seam a slight curve (accounting for my actual shape of a slight curved spine) not a straight line from waist seam up. This got a really great fit in the back and stopped the sleeves and shoulder from slipping off my tiny narrow forward sloping shoulders. Showing my back arm sleeve adjustment. I also adjusted a smidge off the front curve of the sleevehead as well. Once the skirt was attached to the bodice and I tried it on my husband announced that I looked like an Oompa Loompa. Ha ha. (think 1971 version) I actually really value his honest feedback and it did look a bit much for my frame so I shaved off an inch each seam tapering back to nothing top and bottom. I didn’t want take off too much as I love the skirt shape and its exaggerated curve. Other than my normal big mess around with the shoulder area, the bodice fitted me really well. I love the neckline front and back. The box pleats and shape of the skirt is gorgeous. The silk organza underlining really added something special, not only to ensuring the skirt shape and pleats sit perfectly but also it dramatically reduces the crease/crush factor of the linen to almost nothing and feels LUSH to wear. The pattern is extremely well drafted and came together really well. Even my adjustments felt easy and trouble-free to do. As a pear shape I wasn’t sure how the skirt would look but I love it. It actually hides lumps and bumps and skims beautifully over the tummy area. I wore it for a whole day to a special occasion on Saturday and it was extremely comfortable all day. The bodice pattern will be used again. I’m eager to try it with a ponte knit with a half circle skirt and also in a wool crepe with a pencil skirt for a wiggle dress look. The guts of the dress. The underlined skirt feels so nice to wear. I needed to open up the side seams to hem due to tulip shape. I did a very hurried catch stitch the night before I wanted to wear it.